[Lisa edit: Another visit and another guest blog, this time by fellow Canadian ex-pats Kristie and Leo Saumure, who came to Oz from their home in New Zealand to compete in the Sydney half-marathon. Kristie (Lisa’s first PhD student) and Leo moved to Wellington from Edmonton in 2006 but this was their first trip to Australia. Check out their thoughts on Wagga and start planning your own trip, down under, to visit us soon!]. When we arrived in Sydney, the customs officer asked us for our plans while in Australia. When we told her we were planning to spend a weekend in Wagga Wagga with friends, she quickly retorted that you have to know someone if going to Wagga is on your itinerary (though she also reassured us it was a lovely place, just “country”). For our part, we are so pleased that we made the trip; it was great to see more of Australia and catch up with Lisa and Dan following their move down under. 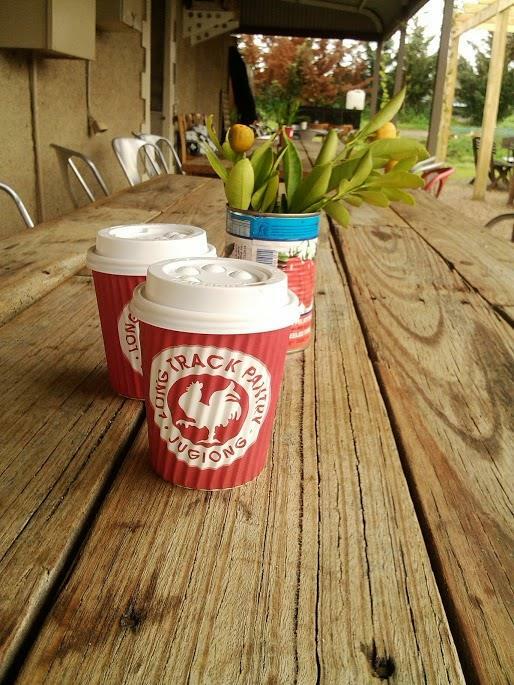 Lunch stop on the way to Wagga at the Long Track Pantry in Jugiong. Our road trip took us from Sydney to Wagga with stops along the way in Campbelltown, Berima, Goulburn, and Jugiong. Of the four towns, Berima and Jugiong made the strongest impressions. Berima was a tiny village with a couple amazing craft/antique/pottery shops and some of the best coffee in Australia. Interestingly, it was made by the potter himself at the Berima Village Pottery Shop. Jugiong offered up a late lunch of the classic toastie at the Long Track Pantry that was both delicious and creative (thanks to Lisa for this inspired lunch stop recommendation). The shop at the Long Track Pantry also offers up some interesting jams, chutneys, and kitchen accessories. Jugiong was also where we saw our first cockatoos (en masse). 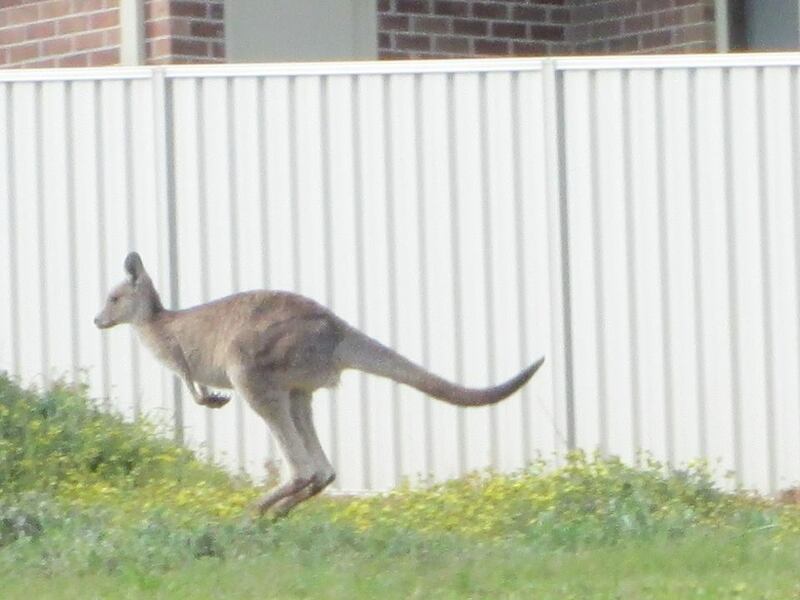 Yes, that’s a fence and a house in a residential neighbourhood – a kangaroo across from Lisa and Dan’s house! We arrived in Wagga just in time to meet three amazing cats (Lester, Malachi, and Ellie) and then head off to a great dinner at the Charles Sturt University Winery. Interestingly, it was Friday the Thirteenth and the theme was akin to what you’d expect at a North American Halloween party. Happily, the themed rubber spiders were the biggest we saw during our Australian vacation. An interesting commonality between New Zealand and Australia is that Halloween is something of a non-entity. However, any other day of the year is fair game for dressing up! 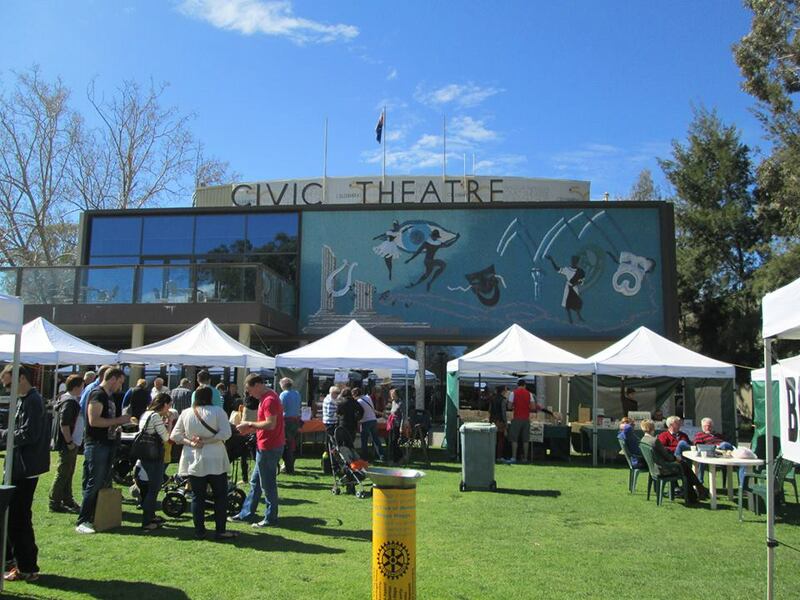 You’ll find Lisa and Dan here once a month, at the Wagga Farmer’s Market. Yum! Saturday morning we had the pleasure of doing a run around Lake Albert. Wow!! That place is bursting at the seams with beautiful birdlife. We saw a bird that in New Zealand would be called a Pukeko, but the Australian translation is Purple Swamphen. Majestic pelicans were another highlight (Murphy’s Law meant we’d left our camera in the car – sigh). And perhaps even more exciting, as we were leaving for Lake Albert, we spotted about 8 or so kangaroo grazing in the field across from Lisa and Dan’s house. So cool and not anything that we would ever have seen if we’d stayed in Sydney!! 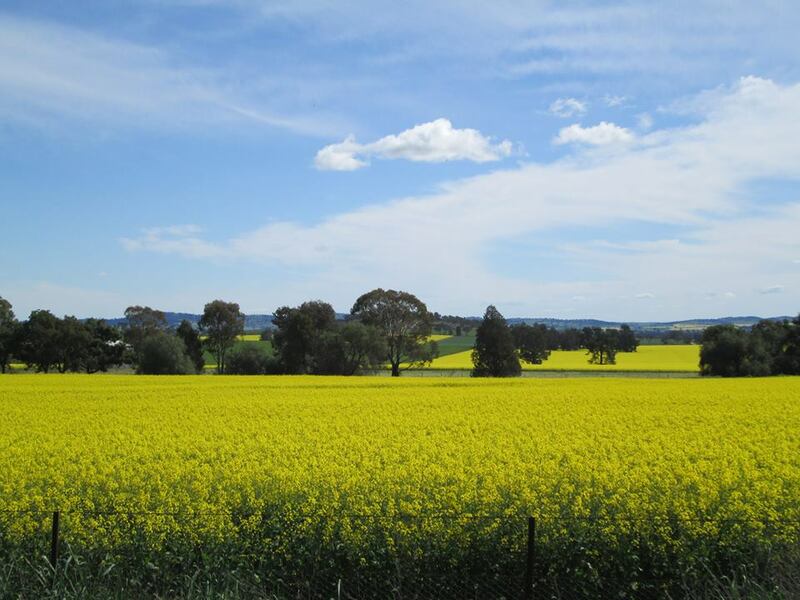 Beautiful fields of canola on the drive to Junee. Upon returning to Lisa and Dan’s, we all left together to experience life on the Wagga side. We got to see what Lisa and Dan might often do on a weekend morning. The weather was amazing, so we lingered at the farmer’s market over coffee and pastries, checking out the wares of all the local vendors. We grabbed some delicious pistachios and if we lived there, would have grabbed cheese, fruit, veggies, breads, etc., etc. In addition to food-based items, Lisa and Dan picked up flowers, which would prove very interesting to the aforementioned cats. 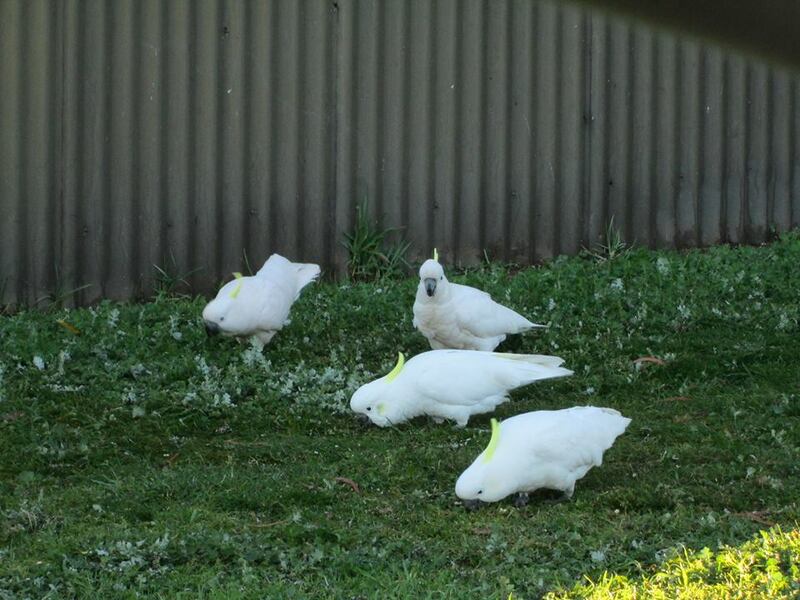 Sulphur-crested cockatoos – they are everywhere! After our wander around Wagga, we headed back to Lisa and Dan’s for lunch courtesy of a French pastry chef who makes his home in Wagga. We indulged in some delicious chicken pies. This great lunch would later be followed by a great dinner prepared by Lisa and Dan – lamb and roasted veggies (yum). We also got to sample some of the pastry chef’s dessert offerings in the form of a lemon tart (also yum). Luck was on our side in that we were able to also have dinner with Becky Willson, a former student of mine (Kristie’s), who is now doing her PhD with Lisa at Charles Sturt University. 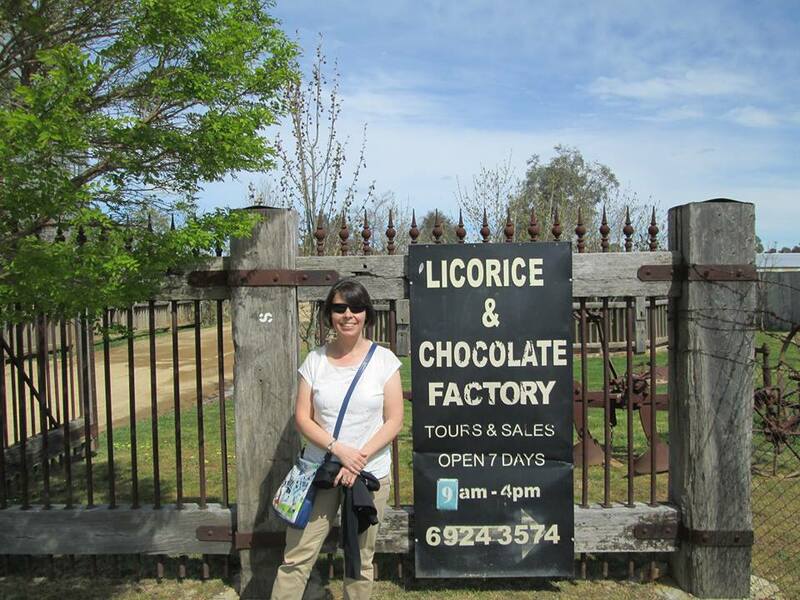 Kristie at the licorice factory, where you can sample dozens of chocolate-covered treats. Sunday brought us to the Junee Licorice Factory, where we met up with Dan who cycled the approximate 70 KM, for a great lunch (and milkshake), followed by some delightful licorice treats. Gorgeous drive out and back with the canola fields shimmering in the sunlight. Were also happy to stop in at the University on the way back to get a look at where Lisa and Dan go to work every day. It’s a beautiful, tree-filled campus that attracts kangaroos in the right weather. Although the snake warnings are somewhat unnerving, Lisa notes that she has only seen dead ones (reassuring). A bridge on the CSU campus in Wagga. A tea/coffee at the Empire Tea Rooms capped the afternoon and we soon headed back for dinner at Lisa and Dan’s. Their culinary skills were demonstrated again with a lemon asparagus risotto. Wow! We were sorry to leave on Monday morning having had such a great visit (thanks Lisa and Dan!). 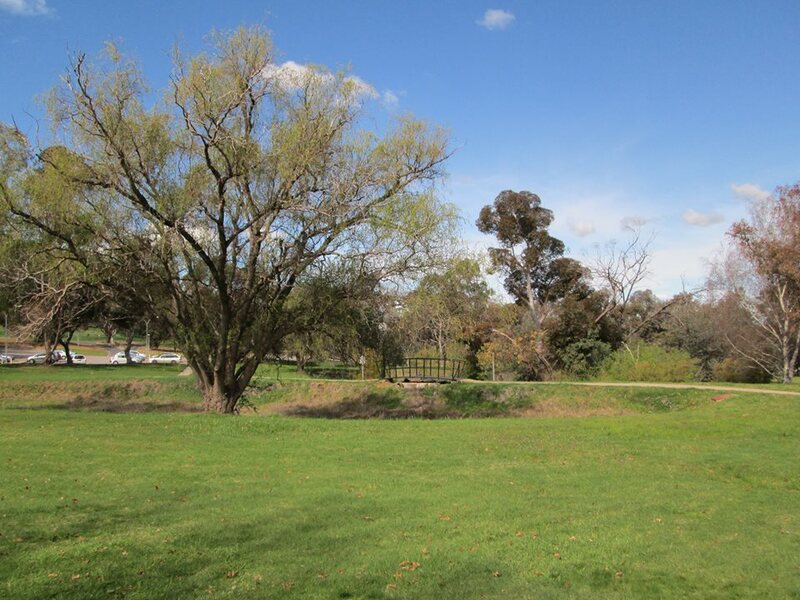 If you’re heading to Australia, it is so worthwhile to step outside the metropolitan areas and experience “country” life in places like Wagga Wagga. This entry was posted in Artisan baker, Australia, birds, Canada, cats, cockatoo, cooking, CSU, Edmonton, farmers market, food, Jugiong, kangaroo, lake albert, lamb, visitors, wagga wagga, wine. Bookmark the permalink.